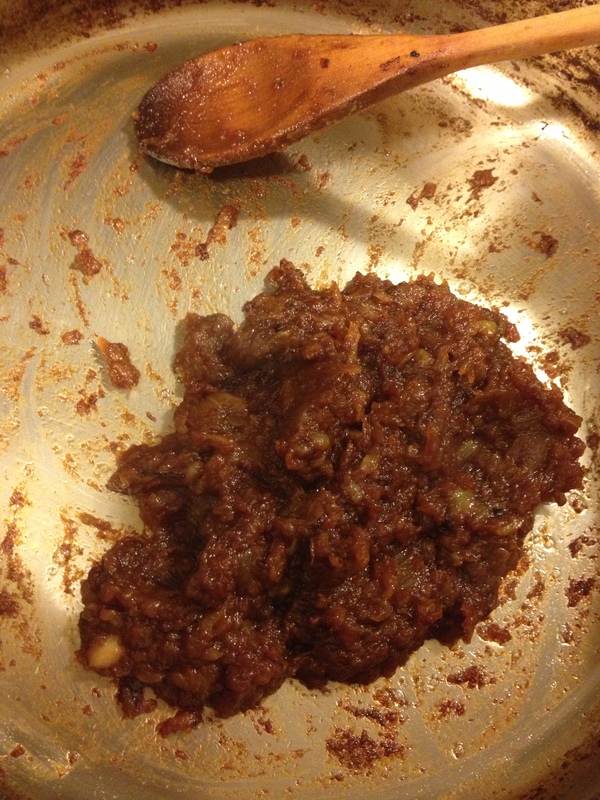 EATS: 10 Minute Caramelized Onions! Let me tell you about my friend Offensive Uriel, so-called because of his alarming sense of humor. Uriel and I met 7 years ago when I was working in Tel Aviv and for some reason, his “comedy” didn’t scare me off. Since he’s also a business traveler, we’ve been able to stay in contact and rendezvous from time to time over the years. I’m very delighted that he and his wife have now relocated to my neighborhood in NYC. Since Uriel is also a big foodie, we eat together and talk home cooking a LOT. The other night, coming home in the middle of the Nor’easter, I stopped by their apartment to dry off a bit and have a sip of brandy. Uriel’s eyes lit up as he started telling me about his new discovery: 10 minute caramelized onions!! If you’ve ever tried to caramelize onions before, you know it’s a mind-numbingly slow and delicate process. I have on occasion described it as: the art of committing, body and mind, to burning your food very slowly. You want them to brown deeply, but not burn to the point of bitterness. It usually takes about 45 minutes to do it classically and you have to babysit the whole time. Before I knew it, we were in the kitchen and he was showing me his new trick and I knew immediately that I had to share it with you, dear Amazons! Yeah, you better believe that’s my bacon drippings jar! Slice or dice your onions. I recommend using at least a pound, possibly more. You will find uses for any leftovers, I assure you. Get your pan hot over med-high heat. Add your fat (I’m using bacon fat, but just about anything will do). Add the onions. 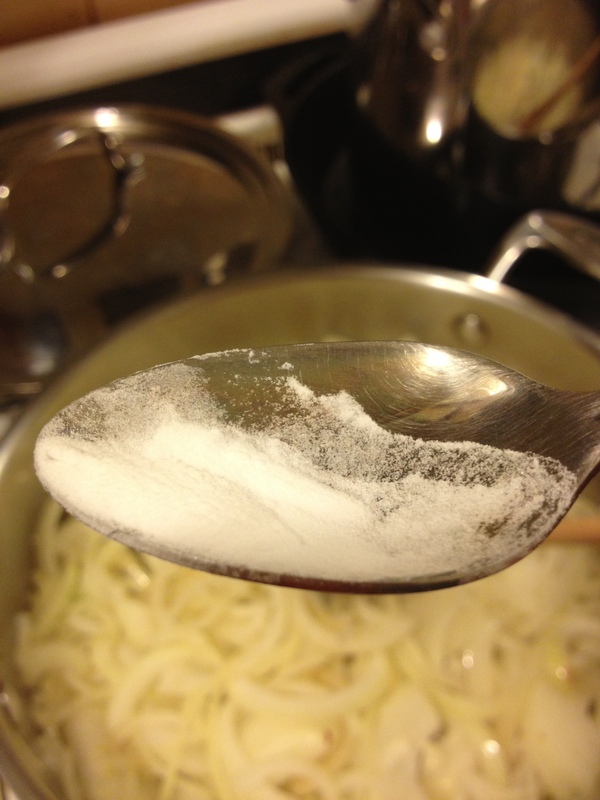 Add the lightest dusting of baking soda, not even ¼ teaspoon. Stir occasionally. Thanks to the heightened pH from the alkaline baking soda, it breaks down the onion and speeds up the Maillard reaction (browning). Within minutes, you’ll have a gooey, brown, tasty pile of onions. If things do start turning for the burny, don’t panic! Add a tablespoon or two of water and let the onions keep working. What can you do with caramelized onions? What CAN’T you do with caramelized onions?! You can use them as a condiment over meat (perfect over steak with a little blue cheese!). Use them to dress up toast or pasta. You can use them as a base for a soup or stew. Sauté mushrooms in them! 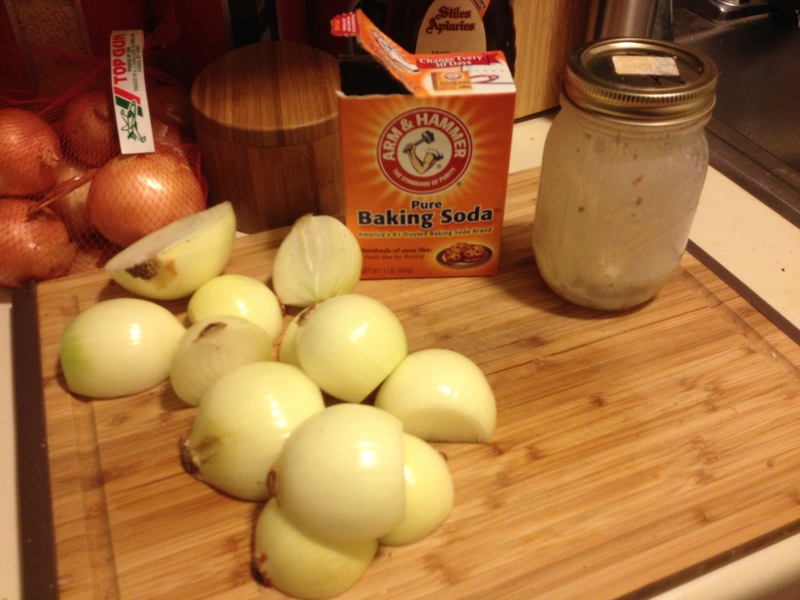 Or make French onion dip! No more nasty packets of powder and dried onions! Some sour cream or greek yogurt, a little mayonnaise, Worcestershire sauce, and paprika, yum! Dip your favorite veggies in and go to town! The other wonderful thing about caramelized onions is that you can adjust their flavor profile to go with just about anything. Add a splash of sherry while they’re cooking. Maybe a little paprika or an herb. Balsamic vinegar would be nice. Bourbon, anyone? Sweet, savory, delicious. I’m using them to smother chicken thighs tonight. What’s your plan? Get creative! Tell me what you did!